Camping is one of the most fun activities you can do during the cool fall months and more people head out into the woods during this time of year than any other. Everyone knows, however, that your camping fun will be largely determined by who you bring along. While your spouse is always fun… ahem… I prefer a really good zombie to camp alongside me. Zombies, while a bit smelly and dangerous, make wonderful camping buddies in the great outdoors. This is, of course, assuming you have them on some type of restraint system. You can’t have them running around eating your brains, right? Anyway, assuming you can get past the whole, “I want your flesh”, thing… zombies make great camping buddies. Every camper has been out on that long hike where your partner simply can’t go any further. You end up stopping and starting and eventually setting up camp in the middle of nowhere because your husband (or wife) just can’t go anymore. Zombies will go on and on forever. You look over your shoulder, and there it will be. Pushing you on to new heights and never weighing you down. You never have to worry about zombies giving out because they are already dead. The only want to eat you. Avoid that and you have a great hiking buddy. When you sit down and start blowing that harmonica to the tune of Old Glory, your zombie will only sit there and moan. It won’t complain or nag you to find a new song. It won’t remind you that you are totally tone deaf. It will just sit there and reach out for your musical genius. Do you ever sit in front of the campfire and suddenly realize the meaning of life? Nothing is worse than sharing your incredible intellect with someone that keeps talking over you. Your zombie won’t do that. He will simply groan and occasionally reach down to pick up his eyeball that fell out. Zombies are wonderful listeners because they can’t talk back… they can’t tell you how wrong you are, and they always agree with you. Another huge fear of mine when I go camping is mountain lions and bears, oh my. The thought of one of these predators getting a hold of me and eating me is horrifying. Not with a zombie in camp. Zombies are dead and have rotting flesh. The predators are going to want them first and give you time to get away. There is also a better than even chance that the zombie will eat the bear or mountain lion. Then the bear or mountain lion would be a zombie. Hmmm, maybe I didn’t think that one through. Even if all the above fall through and your zombie is the worst camping buddy ever, it would still pull through in the end. You know why? No mosquitoes! What bug is coming after you when rotting flesh is right there also? 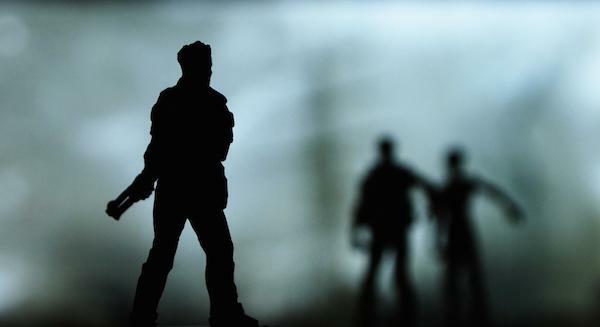 How Dangerous Are Zombies, Really? I love this…and so true! Next time we go camping, I’ll be looking for zombies next to us. There is a local zombie 5k run…trying to outrun zombies. Great exercise and an incentive to run faster! Okay ,now I am super excited for The Walking Dead! Wow, this is great! I really love these types of posts. Zombies are all the rage, aren’t they? I have never understood the Zombie thing LOL, either way my husband is never going camping and I think my boys are of the age where they would miss there TV. Gotta love a zombie, I always did! I actually like the last one, because darn it, those bugs are annoying! Note to self. Donna makes friends with zombies and they can be found at her campsite. Never go camping with Donna. Ever. Yeah not sure I want to go camping you with you…just saying. I love Zombies and the Walking Dead too! This sounds like my kind of camping trip! Oh wow, this was really funny. I love camping! This is really funny! My husband is a big zombie fan. I definitely love the last rule about them the most. Ha! Now I just need to get a zombie to fit in my camping tote, and I’m all set! This is really funny and you make some good points, lol. These are all hilarious! Definitely some needed comic relief on a Monday.